There’s something to be said for taking your influences seriously. If you’re going to honour a thing that already exists, pay homage to it or, as is sometimes the case, straight-up borrow from it – it pays to be respectful and make something worth making from the components you’ve cherry-piked. 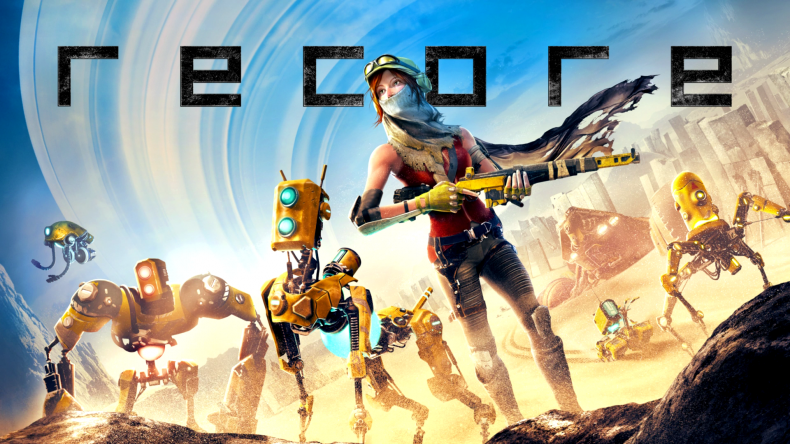 Comcept (and Armature) has succeeded in doing just that with ReCore, a third-person action-adventure title that takes inspiration from a number of classics but manages to emerge as its own entity. It takes place in the distant future after a disease called the “Dust Devil” has decimated life on Earth. The action has relocated to Far Eden, a desert planet in the midst of a terraforming operation, where huge reactors are shaping the atmosphere and the landscape to make it safe for human colonisation. It’s a highly industrialised vision of the future, one in which humanity is reliant on robots powered by AI cores to do the work that fleshy hands can’t do. Everything from security to construction and even companionship is deferred to the machines, and so it doesn’t take a genius to work out where it has all started to go wrong. 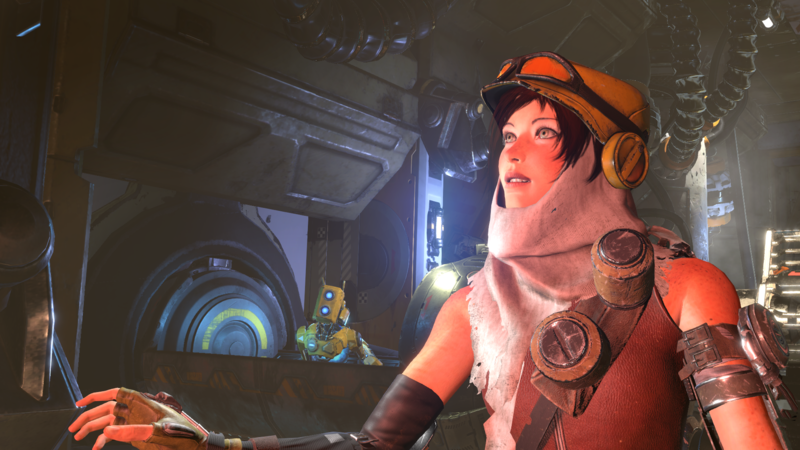 You play as Joule Adams, a young mechanic who has awoken from cryo-sleep to find herself mostly alone on Far Eden. The other deep space transports don’t seem to have arrived yet, including one carrying her father, who happens to be one of the leading minds in the field of core technology. 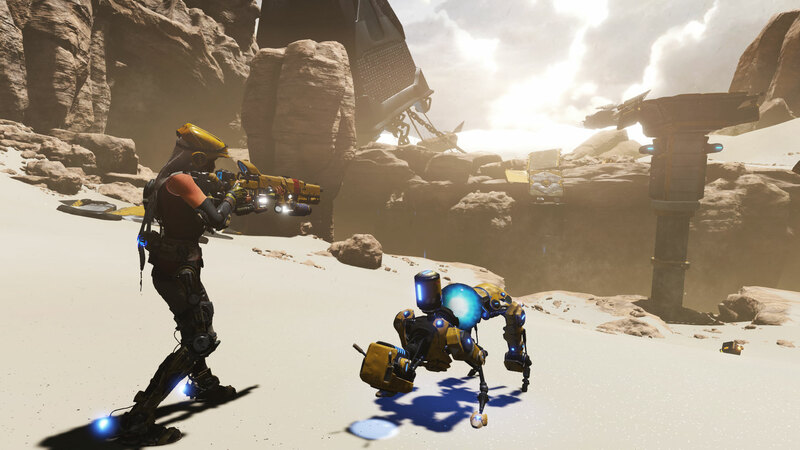 Whether the transports are lost or have been otherwise indisposed is the primary mystery of ReCore, along with just what is going on on the surface of Far Eden. The security bots are imposing strict laws on any and all sentient life, and there’s an immediate sense that our mechanical servants are well and truly revolting. Joule’s primary objective is to restart the power reactors to get the terraforming process back up and running, which she sets to with the kind of plucky determination that puts her the good company of heroines like Lara Croft and Trip from Ninja Theory’s Enslaved: Odyssey the West. She’s capable, smart and armed for bear. Her energy rifle is both a weapon and a tool, which can (eventually) switch between four projectile colours for solving puzzles as well as putting down the mechanical wildlife. Enemies come in a variety of colours dictated by their cores, which you must remove or destroy to defeat them. You can unlock four for Joule’s rifle, and switching to an enemy’s corresponding colour does more damage, but there are also coloured switches to be found within Far Eden’s dungeons that you must shoot to activate. The Metroid Prime influence here is strong, as you’ll be constantly back-tracking around the open world to find hidden treasures and re-visit optional dungeons with new-found abilities. While Joule herself isn’t customisable, her robotic companions are. Initially she is joined by Mack, a faithful canine “Corebot” who’s chassis can be completely switched out to afford him new abilities and buffs which also benefit Joule. Loot comes thick and fast, spraying out of destroyed enemies or blasted crates and boxes, or bestowed upon you in bouquets of dazzling pretty-pretties for completing dungeons. It contains components for researching and developing new parts for Mack and your other Corebots, as well as cores that can be broken down and turned into the currency by which you upgrade the Attack, Defence, and Energy stats of all your companions. The other bots are unlocked periodically as the story dictates, as are Joule’s weapon upgrades, but you’re afforded a fair amount of freedom. The map is a decent size, and exploring will reveal hidden caches, optional dungeons, fast-travel points and, most importantly, “Prismatic Cores”: shiny orbs that act as the currency required to unlock dungeons. Each dungeon has a clear objective, whether it’s an Arena, Speed-run or Adventure, but there are also three secondary objectives for each one, tasking you to complete them in a certain time, find the hidden yellow orb and hit a specific number of coloured switches on the way. Clearing any of these objectives will offer a different reward at the end of the dungeon, but to get the rarest loot you’ll need to achieve all three in one run. Obviously, this adds heaps of replayability to most dungeons and will give those OCD completionists out there more than a few sleepless nights. Combat is fast-paced and exhilarating, taking a couple of cues from Ratchet & Clank in the way Joule zips about, blasting at enemies with a variety of coloured projectiles while her robotic companion chips in to lend a hand. You can order them to use their “lethal” attack by pressing Y, which if used in conjunction with Joule’s charged shot, creates combos to quickly bring down an enemy’s shields, often causing them to switch colour affinity in the process. Once they’re suitably weakened, clicking the right stick attaches Joule’s Extractor, and a tug of war ensues as you attempt to tear the core from the enemy’s body. It becomes a little repetitive after six or seven hours, but it remains fun throughout and always looks impressive. Exploration is just as important as combat, and Joule is a nifty little customer, able to double jump and boost across gaps. The platforming is tight, and again evokes a certain pointy-eared Lombax, but it can take a little while to master the art of long and short boosts, and linking them with the jumps to navigate the trickier climbs of Far Eden. 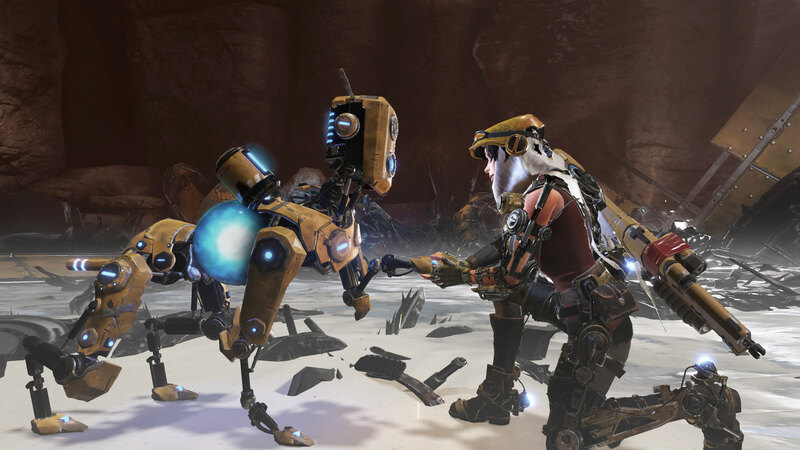 Unfortunately, ReCore suffers from pretty disappointing performance issues. Slow-down, texture pop and mild screen tear are common occurrences on Xbox One, and certain assets in the world will occasionally alter shape or location for the briefest of moments, which isn’t game-breaking but certainly shatters the immersion afforded so painstakingly by the beautifully barren landscapes of Far Eden’s rolling deserts. When it’s running smoothly it can be utterly mesmerising, thanks to the mix of neon colours, glimmering fountains of loot and Joule’s slick, responsive animations, but the technical issues are hard to ignore. By the halfway point switching weapon affinities and cycling through your stable of Corebot companions becomes as intuitive as the satisfying traversal and cathartic combat, and my only complaint where gameplay is concerned is that there’s no character progression or customisation for Joule herself when the concept is so perfect for it. At times, it also seems that more could have been done to make the Corebots truly essential, perhaps with the addition of more taxing environmental puzzles. While abilities like Mack’s digging in the sand feel useful in the moment, they’re quite often the kind of skills that Joule’s highly-advanced exo-suit technology could probably manage without external help. Review code provided by Microsoft. PC version also tested on Ultra spec. Loading times were slightly reduced on PC. Find out how Xbox Play Anywhere works, here. A slick, compelling adventure only let down by a glut of technical issues that really should have been polished out.